The root of goldenseal (Hydrastis canadensis) is primarily incorporated into herbal formulas for upper respiratory mucus and is often used in combination with echinacea root. Historically, goldenseal was one of the most widely used herbal medicines for infections of the gastrointestinal and reproductive tracts, as well as sinuses and eyes, and is considered a specific for supporting healthy mucus membranes. Despite such extensive use, little modern research has been done on its therapeutic efficacy, though considerable investigation supports the broad-spectrum antimicrobial effects of its primary alkaloid berberine. Some research suggests that berberine is not well absorbed, casting doubt on its efficacy systemically. However, other research shows greater absorption of berberine when tissues are inflamed, precisely the type of condition in which goldenseal was historically used. There is substantial concern regarding the quality of goldenseal root products, many of which may be diluted with goldenseal leaf or other berberine-containing plants, such as the roots of Oregon grape, coptis, or barberry. It is fairly easy to detect adulteration of goldenseal as true goldenseal is characterized by the presence of berberine, hydrastine, and hydrastinine, and the absence of palmatine. 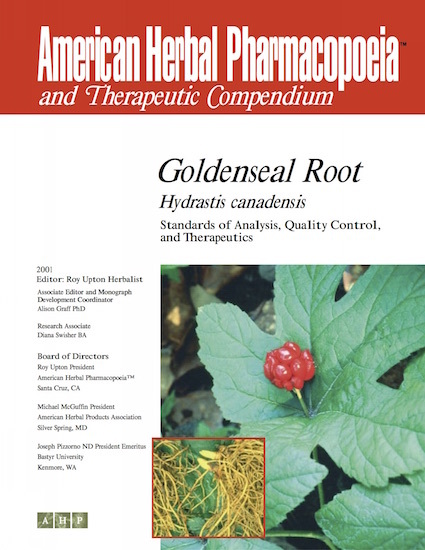 Information is also presented in the AHP monograph on the conservation status of goldenseal, which was once prevalent along most of the East coast of the US. Its extensive use has caused serious depletion of native populations and it is a CITES Appendix II listed herb.